Be the first to share your favorite memory, photo or story of William F.. This memorial page is dedicated for family, friends and future generations to celebrate the life of their loved one. 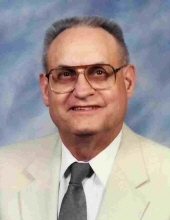 William F. “Bill” Eaton, 89 of Herrin, formerly of Carbondale, passed away peacefully 7:30 p.m. Tuesday, April 9, 2019 at the Herrin Hospital in Herrin. Bill was born May 11, 1929 in Carbondale, Illinois to John R. and Manthus M. (Burress) Eaton. He graduated from Carbondale Community High School was attending his first semester at Southern Illinois University when “Uncle Sam” called him into the United States Army. There he served his country honorably and proudly as a Corporal in the Army Medical Corp (MASH) unit in Korea from 1951 to 1952. He received many medals including one from the Korean Government thanking him for his service. Bill married Norma Jean Robinson on June 6, 1954 at the University Baptist Church in Carbondale. They have shared 64 wonderful years together. To this union they had two children, a son, James W. Eaton and a daughter, Pamela J. Mizerka. He was a charter member of the University Baptist Church in Carbondale. After returning from the Army, his work transferred him to Chicago, there he and Norma lived for 37 ½ years. He was a Christian and loved serving his Lord. He held many positions in the Church and as a Deacon, he and his wife helped build and start three Churches. The last Church they attended was Central Baptist Church in Olympia Fields, Illinois. While living in the Chicago area, he was a Time Keeper in the Forge Shop of the Wyman Gordon Company in Harvey, Illinois. In 1987, he retired from the company and moved to Herrin, Illinois. There he became a member of the First Baptist Church. He is survived by his wife, Norma; son and daughter-in-law, James W. and Nancy Eaton of Benton; daughter and son-in-law, Pamela J. and Michael Mizerka of Herrin; four grandchildren, Donald J. Eaton and wife, Christine of Benton, Chad W. Eaton and wife, Jessica of Clarksville, TN, Kellee A. and James “Jim” Smith of Oak Lawn, IL and Brianne M. and James Chamberlain of Erie, CO; three great grandchildren, Ryan W. Eaton of Clarksville, TN, Isabella Eaton of Clarksville, TN, Matthew J. Eaton of Benton, IL. He is also survived by Dane and Hope Patterson and their children, Mason and Teagen Patterson, Melissa and Eric Perkins and children, Vincent, Arden and Greer also Matthew & Courtney Marlow and daughter, Stephania who were like grandchildren and great grandchildren to him and several nieces and nephews. Bill had five wonderful friends, who he grew up with and went to school with that have remained faith-full for the past 70 years, they are James DeLap, James Mayberry, Jerry Levelsmier, William “Bill” Walkeland and Philip Coleman. This group of boys have kept in touch with each other for all these years. He was preceded in death by his parents, brother and sister-in-law, John Robert “Bob” and Joan Eaton and a brother-in-law and sister-in-law, Evan and Wanda Robinson and two of his five life-long friends, James DeLap and James Marberry. Services will be 11:00 a.m. Tuesday, April 16, 2019 at Meredith-Waddell Funeral Home in Herrin with Pastor Mark Goldman officiating. Visitation will be from 9:00 a.m. until 11:00 a.m. Tuesday, April 16, 2019 at Meredith-Waddell Funeral Home. Burial with a Military Flag Folding ceremony and TAPS will be conducted by the IL Army National Guard Honors Detail will be in Oakland Cemetery in Carbondale. Memorial donations are suggested and may be made to the First Baptist Church in Herrin; envelopes will be available at the funeral home. To send flowers or a remembrance gift to the family of William F. "Bill" Eaton, please visit our Tribute Store. "Email Address" would like to share the life celebration of William F. "Bill" Eaton. Click on the "link" to go to share a favorite memory or leave a condolence message for the family.